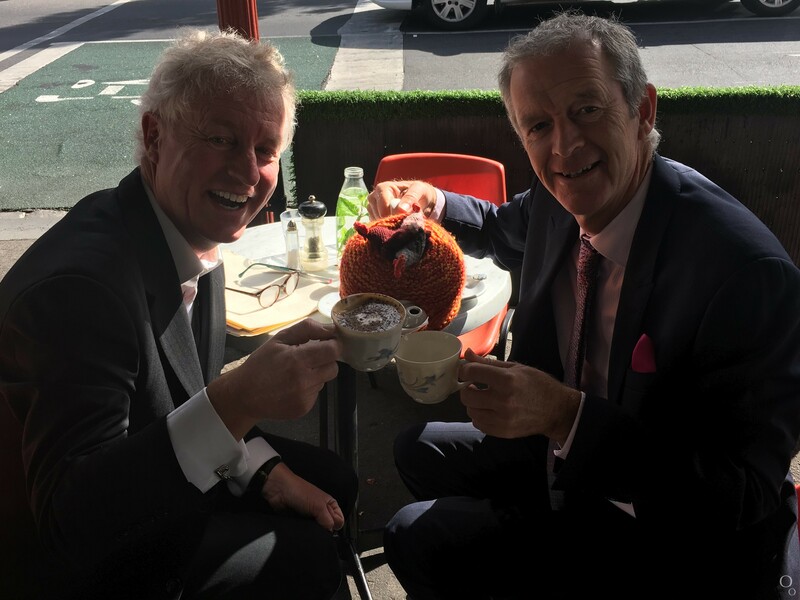 Radio presenter, comedian, politician and author – Ian Cover is one of the most entertaining men in Melbourne and part of the legendary sporting comedy group, The Coodabeen Champions. Peter caught up with Ian to chat all things events, radio and sport for our latest “White with one”. I don’t drink coffee – I’m a tea man. I would have up to three teas a day. I think I’ve had one coffee in my life when I was a cadet journo at The Geelong Advertiser and my editor came in and said “Here’s your coffee” so I couldn’t say no. I’ve never had one since – and that was in the last century. I just don’t like the taste. I once had a cup of tea with Kamahl who famously told me “Ian, you can only have tea two ways – with milk or without”. Peter: How did you end up as part of the legendary football radio group, The Coodabeens? I’m a Geelong boy and was the Geelong Advertiser’s football writer when The Coodabeens started on RRR. My old school mate (and fellow Coodabeen), Billy Baxter, was one of the show’s founders and he suggested they get me on the phone as “the provincial spy”. That was back in 1981 and then I joined them in the studio in 1982 and have been there ever since. Peter: There have been a few lineup changes……. Yes, Simon Whelan and Tony Leonard have come and gone but the rest of us haven’t changed. This is our 38th season, having started on RRR, then to the ABC, onto 3AW and now back at the ABC. If we make it to a 40th year, Simon and Tony have said they’ll come back! Peter: How many shows have you done? We don’t keep records but one of our regular talkback callers, Stan the Statistician from Stradbroke Island, alerted us to our 1,000th footy show in 2016 (Thanks Stan!). By the end of last season, we had chalked up 1,035. It must be some sort of record for Australian radio. Anything with the Geelong Cats playing, especially if it’s winning a Grand Final. I’m also a big cricket fan and it doesn’t get much better than the Boxing Day Test at the G. Basically, I love everything related to sport. Peter: What event would you like The Coodabeens to appear at? Well, we’ve done the AFL Grand Final pre-match so I’m thinking international now. Definitely a European River Cruise would be great. Back home though, it’s hard to go past Morning Melodies at the Arts Centre. I’m sure David Hobson and Marina Prior wouldn’t mind us joining them! Peter: If you could do any other job, what would it be? Something to do with golf. Preferably a pro golfer, then a caddie, right down to a photographer taking pictures of the golf. I’d also like to be Craig Willis on AFL Grand Final Day simply so I could say “Number 9 – Shaun Burgoyne”. Peter: Why is Melbourne a great city for events? It’s part of our history and culture that has not changed in over 150 years. You just need to look at the first Melbourne Cup in 1861 or the VFL starting in 1897 – we’ve been at it for years. Then throw in something like the 1956 Olympics to see how events have been with us for so long. It’s just what we have come to expect now. And, if I can get a plug in for Geelong, we’re getting pretty good at events in Cat City these days. The Cadel Evans Great Ocean Road Race is brilliant. Peter: What event would you like to see in Melbourne? We’ve never had a Winter Olympics so let’s aim high. I’m sure with technology these days they’d be able to make snow to cover the Collins Street hill in years to come. Also, an internationally renowned Marathon as I’d try to get fit to do another one. Peter: Ian, thank you for your time and insights today.